All issues since 2011 are available from this page. Issues are listed in order starting at the top with the CURRENT ISSUE, then next newest to oldest issue down the page. At present we are converting all issues to a full-screen E-Reader allowing you to read issues online with desktop computers as well as mobile devices. E-Readers also give you the option to download a PDF copies. You can then print a copy from your PDF download. If the E-Reader version is not yet available here, you can still download and read a copy online without all the conveniences of an E-Reader. It won’t be long until all E-Reader versions are published. 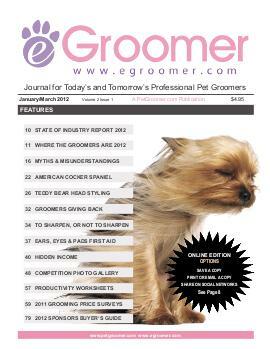 Much of this issue is the 21st State of the Grooming Industry report by PetGroomer.com. It includes the results of surveys conducted with thousands of groomers. You will U.S. grooming prices by regions, a national look at grooming wages and self-employment earnings, including breakdowns by commercial and home groomers versus mobile and housecall groomers. Where the Groomers Are indicates approximate numbers of grooming businesses or pet businesses also offering grooming services in state-by-state format. Where else can you find these figures? 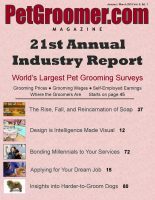 We also look at pet industry market surveys indicating that Millennials are the largest sector of pet owners and our thoughts on how you can bond them to your grooming businesses. Dave Campanella of Best Shot Pet Products wrote an article for the issue, The Rise, Fall, and Reincarnation of Soap, a great read for every groomer with an interest in product and ingredients. 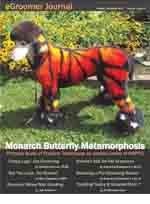 The Upside of the The Upsell in this issue comes from MyFurBabysHeartBeatBear.com. GroomFit writes Groomers Rock with suggestions for groomers on maintaining their physical fitness. Jeff Andrews of Northern Tails Sharpening discusses the FurZone clippers. Angela of American Grooming Academy in California continues her series helping grooming school graduates to find employment best-suited for them with Applying for Your Dream Job. In this issue we have the first in a series of articles on artificial intelligence at the doorstep of pet grooming. A.I. is already changing the hair styling industry, why not pet grooming? What about the hear future smart dryers, vacuums, cages, smartphone health scans of pets to be groomed? How about cage dryers that monitor pet health and turn themselves off when unobserved by groomers and pets go into distress. No more cage dryer deaths? 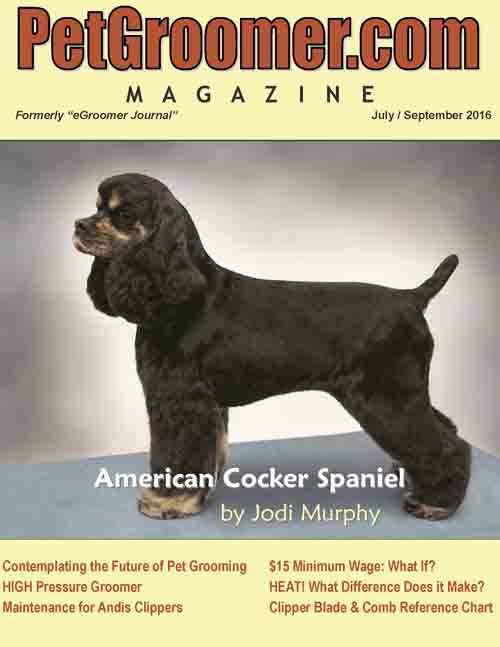 Angela Clark of the American Grooming Academy adds another article to her series assisting new groomers to find the right job. GoMobile Conversion’s article discusses power systems for mobile vans. Erica Salvemini discusses Reiki and grooming education. Groomfit for health discusses balance for groomer’s bodies and health. Double K gives an extensive discussion of stand, cage and force dryers. Jeff Andrews of Northern Tails Sharpening tells us why it is good to not only have sharpening done by factory-trained and the weaknesses of the factory training system compared to the National Beauty Tools Sharpeners Guild certifications. The differences are major! Finally there is a cat grooming article, a classic reprint, by Danelle German on Crispy Legs (cat grooming). 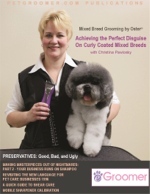 In this issue: Creating a Grooming Portfolio by Angela Clark, of American Grooming Academy. Nearly a dozen more articles. Award-winning blogger Debi Hilley’s article on How Hot is Too Hot? 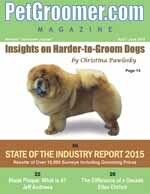 A large industry news section brings groomers up-to-date with happenings in the industry. 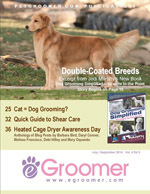 Vera Needham contributes to groomer health with her article, Groomfit: Muzzling Upper Back Pain. Jodi Murphy highlights instructions for Flag, Westie, Rat and Poodle Tails. Northern Tails Sharpening has contributed Cleaning the WAHL 5-N-1 Trimmer Blade with pictorial instructions. Further they share solutions for common problems when using comb attachments. We take another look at Barbara Bird’s exceptional article To Clip or Not to Clip (alopecia) and What We Know and Don’t Know About Canine Hair Growth. 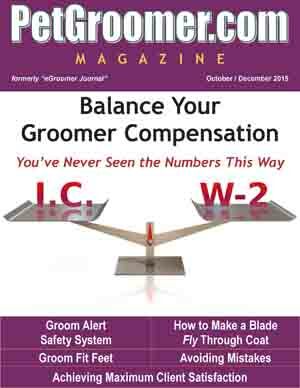 Grooming Business in a Box® has updated Balance Your Groomer Compensation: You’ve Never Seen the Numbers This Way. 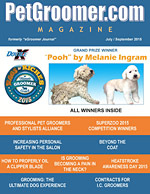 The issue includes handy reference charts for all groomers. 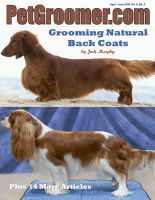 In this issue: Grooming Natural Back Coats by Jodi Murphy, Master Pet Stylist (see cover). Fourteen more articles complete this big issue. 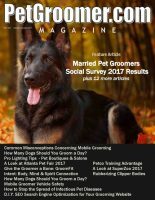 Thumbtack.com shares their dog grooming price survey from coast-to-cost of the U.S. Then A Day in the Life of a New York City House Call Cat Groomer, followed by Wag’n Tails’ article How Owning My Mobile Grooming Business Changed My Life – What Our Clients Tell Us. Metrovac.com tells us more about their Master Blaster® Dryer. 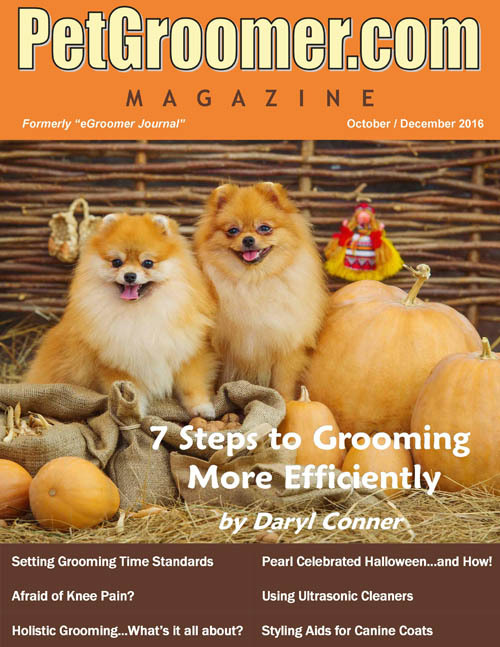 Groomadog Academy shares their article Speed Grooming Without Rushing, and then two articles on Pet Retail Merchandising for Groomers. 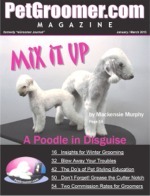 Dog Grooming School of Pennsylvania shares their article Grooming: A Dance You Do with the Dog. GroomFit article is next, Away with Ankle Biters. Northern Tails Sharpening comes to our aid as always with Fixing the Blade Drive Screw Hold on the Andis Clipper. Grooming Business in a Box® provided us with When Employees are Employers: Wrong! and Dual Commission Rates for Groomers Made Easy. 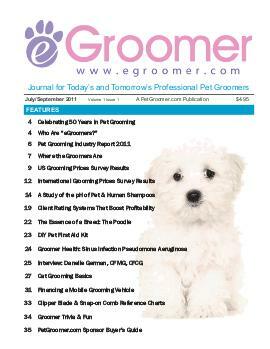 Further there is The Mobile Grooming Difference, and American Grooming Academy’s article, Writing a Grooming Resume. 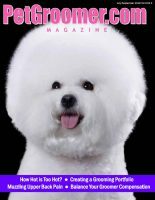 Finally there is our choice of a classic reprint photo article with Jay Scruggs helping us Styling the Bichon Frise Puppy. 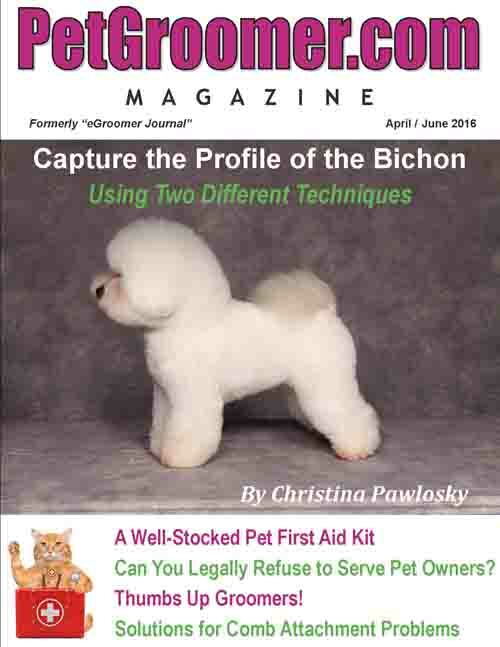 The issue closes with the PetGroomer.com Sponsors Only Buyer’s Guide. 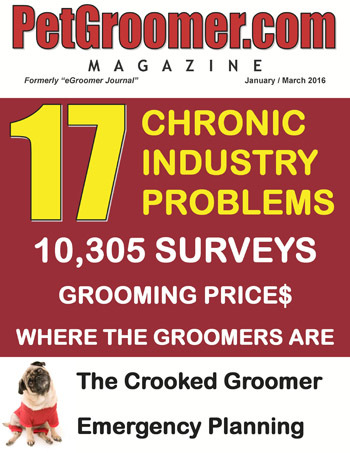 In this issue: The industry’s most complete grooming industry report featuring the results of 12,000 groomer surveys (20th Annual Industry Report by PetGroomer.com). Also featuring: “Vogue,” a creative style and how-to instructions by Joanne Parker, Pet First Aid Kit Update, Great Signage Works for You 24/7 by Leel Michelle, Groomfit: Your Change Weights by Vera Needham, Quick Fix for New Style Andis Blade Drive by Jeff Andrews Northern Tails Sharpening and the PetGroomer.com Sponsor Buyers Guide. 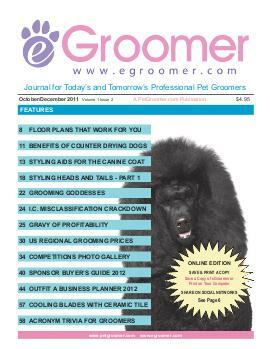 In this issue: Common Misconceptions Concerning Mobile Grooming, How Many Dogs Should You Groom a Day? 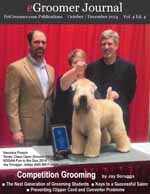 by John Stockman, Wag’n Tails Mobile Conversions, Pro Lighting Tips by Leel Michelle, Married Pet Groomers Social Survey 2017 by Grooming Business in a Box®, A Look at the Atlanta Pet Fair 2017, GroomFit: Give the Groomer a Bone by Vera Needham, Intent: Body, Mind & Spirit Connection by Melissa Denier, How Many Dogs Should You Groom a Day? by Melissa Verplank of Learn2GroomDogs.com, Mobile Groomer Vehicle Safety by Mary Oquendo, How to Stop the Spread of Infectious Diseases, D.I.Y. 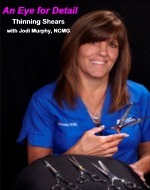 SEO of Your Grooming Website by Mitzi Hicks, Rubberizing Clipper Bodies by Jeff Andrews, Northern Tails Sharpening. 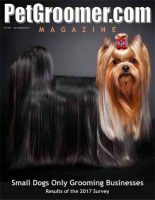 In this issue: Small Dogs Only Grooming Businesses by Grooming Business in a Box®, How to Build a Treat Bar by Leel Michelle, GroomFit: Shoulders Going to the Dogs by Vera Needham, Advantages for Groomers Working for Larger Organizations, Tips to Help Customers Keep Pets Cool in Summer, Attachments, Cords and Andis Clippers by Jeff Andrews of Northern Tails Sharpening, German Trim on a Standard Poodle by Christina Pawlosky (classic reprint article). 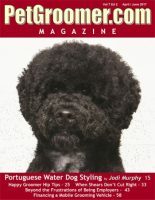 In this issue: Portuguese Water Dog Styling by Jodi Murphy, GroomFit: Happy Groomer Hip Tips by Vera Needham, When Shears Don’t Cut Right by Jeff Andrews, Northern Tails Sharpening, Beyond the Frustrations of Being Employers by Grooming Business in a Box®, Financing a Mobile Grooming Vehicle by Wag’n Tails Mobile Conversions. 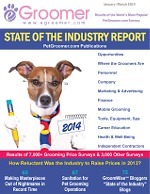 In this issue: The industry’s most complete grooming industry report featuring the results of 11,000 groomer surveys (19th Annual Industry Report by PetGroomer.com). Also featuring Dryer Induced Seizures, GroomFit: Doggone Back! by Vera Needham, Blade Care Duo by Jeff Andrews, Northern Tails Sharpening, Ingredients by Barbara Bird (classic article reprint), Tennessee Ruling on Independent Contractor Groomers. You can download ALL of the publications below. The E Reader versions are not yet posted, yet coming soon. Is Grooming Becoming a Pain in the Neck? Where Are the IC Contracts? I Paid Off My Van, Now What?